Down to Earth's vast spread of prepared vegetarian foods meets such high standards of culinary tastes that it is a destination point for people of all walks of life seeking tasty and healthy food. Pictured above is the deli hot table and salad bar at the company's Honolulu store on King St. (near University Ave.). Our deli food is all made fresh locally from scratch! No artificial ingredients or preservatives are used. Just natural, homemade goodness! The deli at Down to Earth is Hawaii’s leading vegetarian deli. You’ll find delicious entrées on our hot table and cold salad bar and a wide variety of baked goods, including vegan and gluten-free options. You’ll also find a great made-to-order sandwich menu, fresh juices and smoothies, and grab-and-go items made fresh daily. It’s a vegetarian culinary delight! 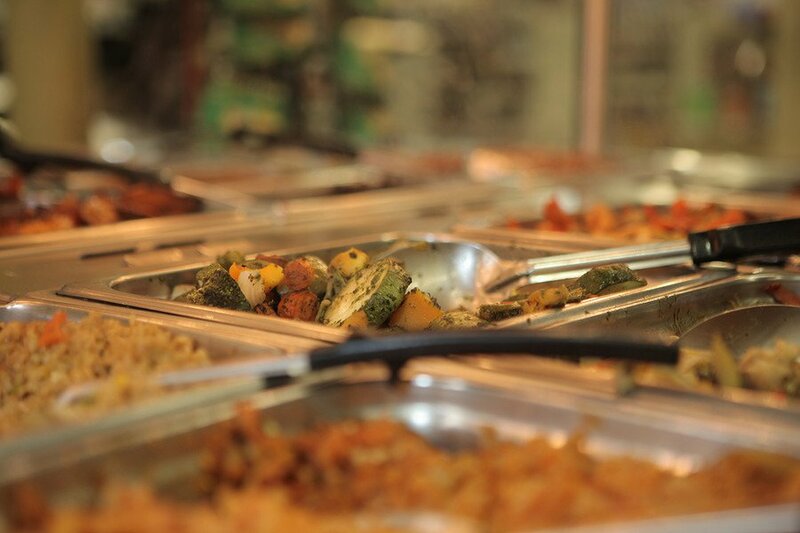 In fact, our vast spread of prepared vegetarian foods meets such high standards of culinary tastes that it is a destination point for people of all walks of life seeking food that’s not only tasty but good for you, too! And did we mention you don’t have to be vegetarian to enjoy eating here! Check out our menu of made-to-order sandwiches, fresh juices, and smoothies.